It just wouldn’t be a Star Wars Celebration without a trailer reveal! At the end of the Star Wars Episode IX panel, director J.J. Abrams thanked the cast and moderator Stephen Colbert before dropping an Episode IX teaser trailer. It’s the first footage of any kind from Episode IX, and you can watch it below! 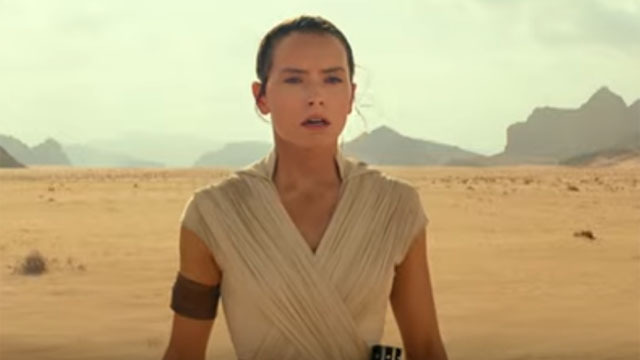 Additionally, the trailer revealed that Episode IX’s title is The Rise of Skywalker. The end of the trailer also appears to indicate the return of a classic Star Wars villain. But you’ll have to watch it yourself. We’re not going to spoil it for you. Classic stars Mark Hamill, Billy Dee Williams, and Anthony Daniels return for Episode IX. The late Carrie Fisher will appear in previously unused footage from The Force Awakens. Daisy Ridley, John Boyega, Oscar Isacc, Kelly Marie Tran, Adam Driver, Domhnall Gleeson, and Billie Lourd reprise their roles as well. Lupita Nyong’o will once again provide the voice of Maz Kanata. Newcomers to the cast include Keri Russell, Richard E. Grant, and Naomi Ackie as Jannah. Star Wars: The Rise of Skywalker will open on December 20. What do you think about the Star Wars: Episode IX trailer? Let us know in the comment section below!